In a small bowl, toss the shaved carrot and thinly sliced cucumber with two tablespoons of Honey Ginger White Balsamic and set aside. Heat 3 quarts of water to a gentle simmer. Remove the pot from heat and immediately stir in two tablespoons of soy sauce and two tablespoons of Honey Ginger White Balsamic. Add the vermicelli rice noodles to the seasoned water and allow to sit for 10 minutes until tender. Drain well and toss with an additional 1/2 teaspoon of sesame oil blended with 1/2 teaspoon soy sauce, and 1 teaspoon Honey Ginger White Balsamic. Set aside. On one edge, lay a small handful of noodles, two shrimp halves, some cilantro, a few baby spinach leaves, some cucumber strips, a few pieces of shaved carrot, and a sprinkle of green onions, being careful to not over stuff the roll. 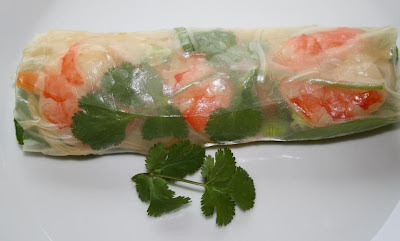 Carefully start to roll up eggroll style, tucking in the sides, then continue to roll up - but not too tightly or the spring roll will split. For the dipping sauce, combine a few spoon-fulls of hoisin sauce with some chopped peanuts (or serve with prepared spicy fish sauce dip called Nuoc Mam, available at Asian markets).